Price is almost always the first question when it’s time to clean your septic tank. Why? Because who would rather spend their money on their septic tank instead of on something tangible or fun? We get it! But just because you don’t see it every day doesn’t mean it’s not an important investment to your home (and your health). 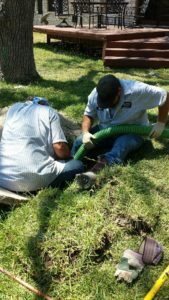 Depending on the tank size (and system type) the average pumping cost in the San Antonio area is between $375.00 to $750.00. While it may seem like a chunk of change when paid all at once, it really averages out to about the same, or less, than if you paid a monthly fee to centralized sewer services. The recommended pumping frequency is every 3-5 years. This means your monthly average cost is about $11.00 to $20.00 if you break it down. Now, that doesn’t seem too bad! A skilled technician, who is also a licensed CDL driver, to provide the pumping. Skilled technicians do not work for minimum wage. Just think about what they are dealing with everyday! It’s a dirty job, and “someone’s gotta do it”, but not just anyone will do it for any price. Locating tanks takes skill and experience, and believe it or not, so does working a shovel! So, not only is the technician a CDL driver, but that driver must also be a skilled laborer, willing and able to work in freezing weather, over 100 degree weather, and rain. Other costs associated for the pumper or company include dumping fees, licensing, training, insurance, workers compensation, payroll, payroll taxes, general overhead to keep the office lights on and someone to answer your phone calls and questions. Who is responsible for exposing the tank lid(s)? Will the company do it for you? Will they charge for digging? Are dump fees included in the quoted price? If you don’t know the facts about your system, you can usually find the septic records with your county’s septic department. The records will usually include items 1 – 3 listed above. At Van Delden Wastewater Systems, we are happy to look up your address to see if we have any history on the system. Our company records go as far back as 1970. If we don’t have a record, we can ask you a few questions and get you the most accurate estimate possible over the phone. Please call us today at 210-698-2000. ← Are All Aerobic Septic Systems the Same?